Anyone who has seen a sunrise from a viewpoint overlooking a grand vista knows the wonder of seeing the contours of the earth revealed as the light washes over the landscape and chases away the shadows. A world once dark and confining becomes bright and expansive, and a sense of direction and place is enlivened. What does this have to do with today’s Gospel? 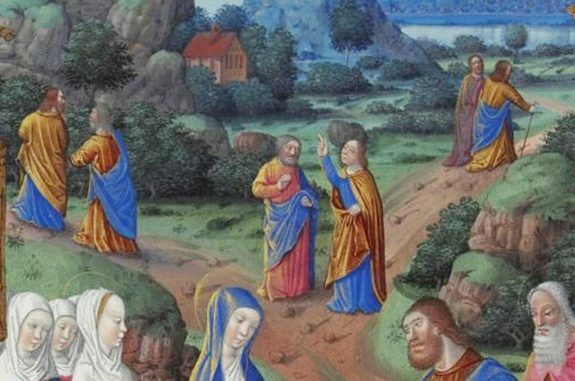 A great deal, for everything that happened after the Transfiguration and led up to Christ’s Passion was illuminated and touched by the glory seen by Peter, James, and John. And while those three apostles kept silent about what they saw (Lk. 9:36), the Evangelist Luke wanted his readers to understand the landscape of Jesus’ journey to Jerusalem in the light of that glorious event. When Jesus appointed seventy-two men (or seventy, depending on the translation), he deliberately patterned his action after the selection of seventy elders by Moses. Those men were meant to share in the spirit given to Moses so that, as God told Moses, “they may share the burden of the people with you” (Num. 11:16-17). Earlier, Jesus had given the Twelve “power and authority” over demons and illness, then sent them to proclaim the kingdom of God and to heal the sick (Lk. 9:1-6). Some of the Church fathers understood this as an establishment of apostolic authority, whereas the selection of the seventy pointed toward the establishment of the priesthood, for priests are co-workers who assist the bishops in their duties (Catechism of the Catholic Church, 886, 939). The kingdom of God is the fulfillment of those expectations about the meaning of history and God’s plan for mankind—and the Church is “the seed and beginning of this kingdom” (CCC, 567, 669). Christ established the kingdom by his preaching and his Passion, and he entrusted the message of the kingdom to the Twelve and to the Church so it would grow and so it could be seen for those with eyes to see. “In the word, in the works, and in the presence of Christ, this kingdom was clearly open to the view of men” (Lumen Gentium, 5). And every household that accepts Jesus is taken into the household of God, the Church, which Paul called “the Israel of God.” Within it, a world once dark and confining becomes bright and expansive.